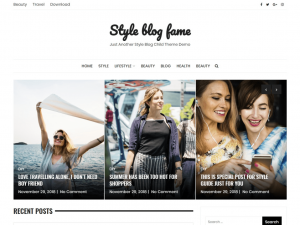 Style Blog Fame is a child theme of Styleblog WordPress theme. Style Blog Fame is perfect for creating adult websites like personal blog, tube site, gallery site, membership site and more. Style Blog Fame is beautifully designed, responsive, and cross browser compatible. This theme is easy to use, can be easily customizable via customizer. Style blog fame extends features & functionality of StyleBlog. Style Blog Fame offers additional banner slider, logo placement option etc.